Plecos are tropical fish. They will also grow to about a foot long. Some individual fish have grow to about 2 feet. This should be kept in mind before purchasing the fish. Plecos require a large tank about 55 gallons. They are pretty hardy fish. It is easy to care for them. A pH of 6.5 to 7.5 is ideal. The temperature can be between 23 and 30 degree Celsius. Provide plenty of hiding places such as rock overhangs, driftwood and plants for the pleco to rest during the day time. 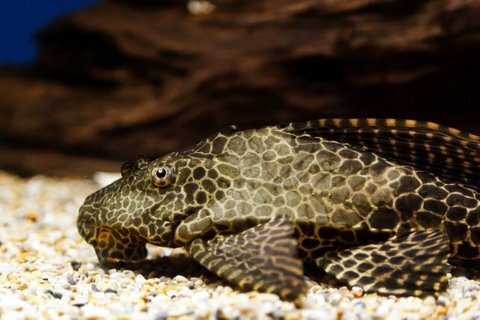 Plecos are nocturnal fish and they are most active at night. Plecos are highly territorial. They require at least 75 gallons per individual. While they get along well with fish of other species, they become aggressive and hostile with members of their own species. Hence, it is not advisable to have plecos together. Besides, plecos have a high bioload. They are voracious eaters and produce copious amounts of waste. The water in the tank can get dirty with many plecos. If you must have more than one plecos, ensure that the tank is large enough. Make plenty of hiding places and ensure a thick vegetation. Also make sure that the Filtration system can handle the waste produced. It is better to put plecos together when they are young so that they can get used to company of their own kind. In the wild, they feed on plant matter and detritus on the bottom of the river or stream. They also eat other vegetation. In a tank or pond setting, you can feed plecos algae wafers. You can also feed them vegetables like cucumbers, zucchini, cabbage and lettuce. One problem in giving vegetables is to get the vegetables to sink down to the bottom. Some vegetables like cucumbers will sink down after a few hours. Other like cabbages and lettuce will need to be held down by a piece of stone or a vegetable clip. While plecos eat the algae growth in the aquarium, it is not sufficient. They need to be fed the food mentioned above. Baby plecos in the first days will have to be fed infusoria or baby brine shrimp. Plecos are tropical fish. They will also grow to about a foot long. Some individual fish have grow to about 2 feet. This should be kept in mind before purchasing the fish. Plecos require a large tank about 55 gallons. They are pretty hardy fish. It is easy to care for them. Provide plenty of hiding places such as rock overhangs, driftwood and plants for the pleco to rest during the day time. Plecos are nocturnal fish and they are most active at night. Plecos are bottom feeders. In the wild, they feed on plant matter and detritus on the bottom of the river or stream. They also eat other vegetation. In a tank or pond setting, you can feed plecos algae wafers. You can also feed them vegetables like cucumbers, zucchini, cabbage and lettuce. One problem in giving vegetables is to get the vegetables to sink down to the bottom. Some vegetables like cucumbers will sink down after a few hours. Other like cabbages and lettuce will need to be held down by a piece of stone or a vegetable clip. How can we tell the male pleco from the female pleco ? Plecos are difficult to tell apart based on their gender. It is almost impossible for the aquarist to tell them apart. Experts say that the genital papilla of the male protrudes during the mating season. This distinguishes it from the female. This is very inconspicuous and the difference is not obvious to the untrained eye. Plecos are difficult to breed in the aquarium. Breeding has been done in large aquariums and in fish farms. Plecos are from South America. They live in the many streams and water bodies which make the Amazon basin. In the wild, plecos breed in small underwater caves in the banks of the river. This can be difficult to mimic in the aquarium or pond setting. Some people have reported success with small pots which act as the caves. Water changes up to 50% have to be done every day. This simulates the rainfall in its native region. During the breeding season, a male takes over a cave. He cleans it and arranges its side. If a female is interested, she will deposit her eggs in the cave. The male then looks after the eggs. After a few days, the eggs hatch. The young ones have a yolk sac which sustains for the first few days. Once the yolk is depleted, the babies started eating from the algae. Remove the babies to a separate aquarium to protect them from being eaten by the other fish. Once the eggs hatch, you can provide it with infusoria or baby brine shrimp.